Should Veterinarians Enrol in Contemporary and Alternative Veterinary Medicine Courses for Continuing Education? Some states require veterinarians to complete minimum hours of continuing education to renew their licenses. While the number of hours vary depending on the state, and CE can be a big help to veterinary practice, a contentious issue on whether Contemporary and Alternative Veterinary Medicine (CAVM) is significant in continuing education in the field of veterinary medicine has been debated on for years. There is an increase in the number of CAVM CE courses offered, and advocates for alternative medicine stand behind the efficacy of this practice. However, those who believe in traditional veterinary medicine do not agree with this. CAVM practitioners and people who prefer it posit that unlike medications given by traditional veterinarians which can damage the organs with long-term use and have side effects, alternative medicine uses herbs, acupuncture, homeopathy and natural products which have lesser or no side effects at all. If veterinarians integrate traditional medicine with alternative practice, they can prescribe natural remedies instead of drugs for sick animals if they see fit. 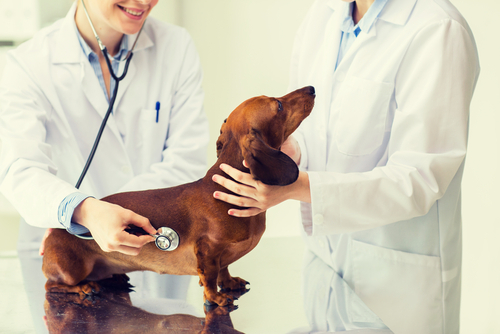 Veterinarians who practice alternative medicine use holistic methods which heal the mind and body which in return provides healing at the DNA level. By using therapeutic touch and nutritional therapy, wellness can be achieved since the body can heal itself. Alternative medicine does not have diagnostic capabilities to know what is exactly wrong with a sick animal. Laboratory tests, X-rays, ultrasound and blood work are diagnostic tests needed to know if a patient has infection, tumor, broken bones and the like which the practice of alternative medicine does not use. Herbal medicines have no therapeutic claims and have not been tested and approved by the FDA. This means that there is no telling if they are indeed effective. Critics say that acupuncture is similar to the placebo effect. Pets can get injured and suffer medical conditions such as fractures, stones, eye problems which require surgical procedures and other treatments which holistic therapy and acupuncture cannot remedy. This is why it important for veterinarians to enhance their surgical skills and treat animals that need surgeries. That said, practitioners of veterinary medicine should enrol in continuing education workshops such as Plates and External Fixators, Perineal Urethrostomies and Ophthalmic surgeries, to be able to perform these procedures and provide science-based care. Both traditional and alternative medicine offer elements that are intended to improve a patient’s well-being. These fields complement one another and should not be sought as one versus the other. Continuing education courses for traditional veterinary medicine. is focused on enhancing surgical skills; a truly necessary component of small animal practice. https://focusandflourish.com/wp-content/uploads/2017/07/shutterstock_491352472.jpg 334 500 FocusandFlourish /wp-content/uploads/2016/06/logo.png FocusandFlourish2017-07-26 10:00:392017-07-21 21:22:09Should Veterinarians Enrol in Contemporary and Alternative Veterinary Medicine Courses for Continuing Education?